Squash House Quilts: Peter Cottontail and a Pitiful Puss! Peter Cottontail and a Pitiful Puss! Here is my Peter Cottontail Sweet Stitches March block! I think this is the cutest rabbit, ever! Speaking of cute - and pitiful! Miss Sasha chewed open her stitches from being spayed and got a little infection. She's now confined to this nasty collar until some serious healing happens. I think Mr. Squash and I feel worse than she does. But it hasn't stopped her from eating and playing! That's our girl! Poor Sasha. Hope she heals fast. Sasha trumps Peter for cuteness. I hope she heals quickly. As for Peter, that is a really pretty block -- are the eggs fabric applique? They almost look as if they're painted. Your stitching is so neat. Love Peter Cottontail! But, I really love Sasha! 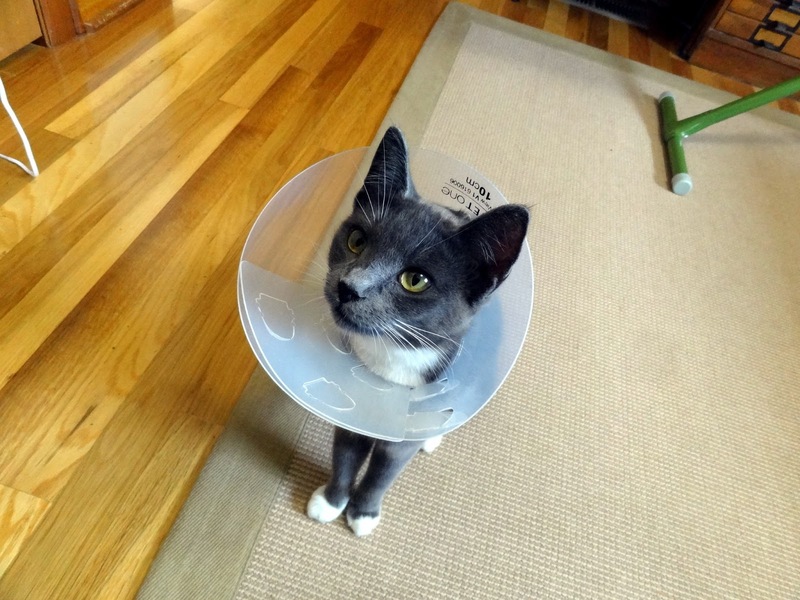 Poor kitty - hope she loses the conehead soon! Peter Cottontail is so cute. You do beautiful work. And poor Miss Sasha, I like to call it the cone of shame - cuz usually they act like they've been shamed and can't move with it. Glad to hear it's not stopping your girl and I hope that infection clears up quickly. Hugs and Happy Easter!! The eggs appear like they're appliqués. Cute Peter, cuter Sasha. Oh no, not the 'cone of shame'! At least it will help her heal now. Get well soon Sasha. Lovely stitching Candace just in time for Easter. Happy Easter, Candace!!! Sasha is soooooooo cute and sweet! I just want to give her big hug and kiss!!!! Lol!! I hope she heals up soon! I can understand how you guys feel about her wearing that cone. I would feel the same. 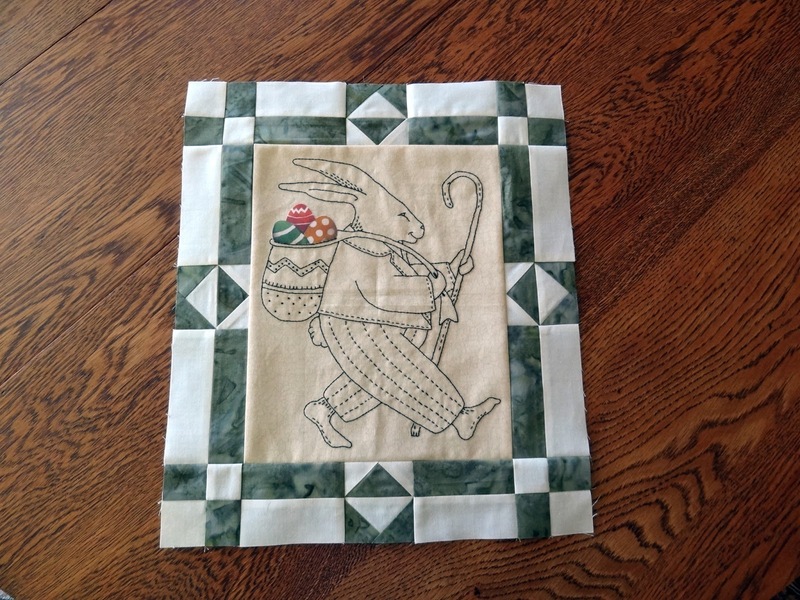 Love your Peter Cottontail block! Cute Peter Cottontail, I like his name too. Poor Sasha! Did you remind her it's for her own good? ADORABLE Peter cottontail!! Awwww Poor Sasha! You need to decorate his little collar! Peter on the other hand, is looking quite good! Peter's striped pants are over the top cute! Poor Sasha--this too will pass. You'll be glad when you don't have to hear that in-heat yowling. Yikes. Your Peter is gorgeous! Wonderful stitching and piecing! Love Peter. I hope Sasha heals quickly. Happy Easter to you and Mr Squash. She definitely has that look that says, "You'll be sorry!" She has such a pretty face. Ya gotta love her and I know you both do. I just love that rabbit. Great stitching! Oh how cute. Peter Cottontail has never looked better. Aww.. Poor kitten! Hope she is feeling much better now. I think the rabbit pattern is supper cute but I wasn't feeling the green batik I got in my kit. I am making mine in a dark purple. Sasha actually looks quite happy even with that thing on her neck. The stitchery is adorable. I hope Sasha heals soon. She still looks cute with the cone. The bunny and the kitty are both adorable! New Look and a Giveaway!